This is not the sort of bike you’d normally find here. But we’ve never featured a Hayabusa before, and this one is projected to do a remarkable 230 mph—or 370 kph, depending on where you live. To put that into perspective, BMW’s all-conquering S1000RR tops out at around 195 mph. 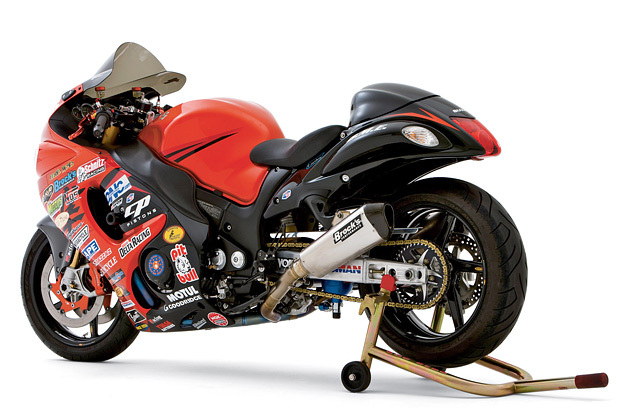 This particular GSX1300R was built by Sims Motorsports in the US, and is much more interesting than the average tweaked superbike. For starters, although it’s running a nitrous injection system, the crankshaft and connecting rods are stock. The fuel injectors are stock too. A heavy-duty crankcase stops the motor from tearing itself apart, and the cylinders are bored out from 81 to 86 mm. Massaged into an offset configuration, they bump up the displacement from 1299 to 1510 cc (92 ci). The cylinder head porting was done not by hand, but with a five-axis CNC machine. Megacycle provided the custom cam profiles, but the toughened valves retain the stock dimensions. There are too many other upgrades to mention, but a skim through the specs reveals Öhlins 43mm inverted forks, BST carbon fiber wheels, Beringer brakes and a sinuous CT Series exhaust from Brock’s Performance. 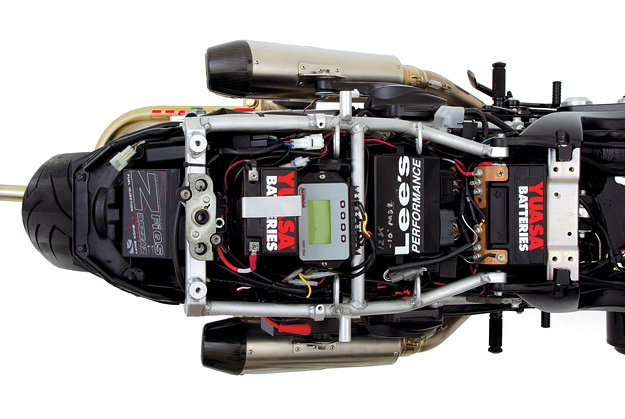 There’s even a twin-battery electrical system (below): a tuned Hayabusa engine is very hard to start. The upcoming July issue of Sport Rider has the full spec, but you can read the excellent article online now. 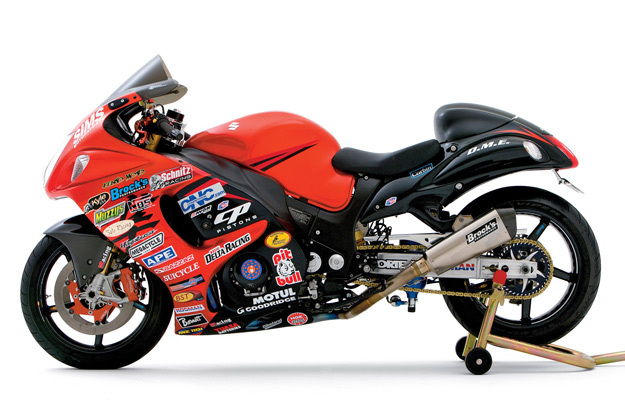 They got the bike up to 213 mph in a warm-up, by the way—without switching on the nitrous system.